Come and See What's Growing! Indigenous plants are often overlooked by modern agriculture, but they offer a wealth of beauty, nutrition and adaptive ability to farmers. 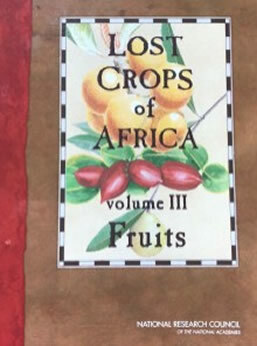 John found a trio of books on the native grains, vegetables and fruits of Africa, available to the public for FREE. You can read about them and find links to download these important resources for your library on John's blog, at www.johnjeavons.org. Spanish subtitled GROW BIOINTENSIVE How-To videos are now on YouTube! Para verlos, haga clic aqui. AmazonSmile is a simple and automatic way for you to contribute to Ecology Action every time you shop. When you shop at smile.amazon.com, you'll find the same prices and selection as Amazon.com, with the added benefit that Amazon will donate a portion of the purchase price to EA. If you're going to buy something on Amazon's website, instead of going to amazon.com as usual, go to smile.amazon.com. Select Ecology Action of the Mid-Peninsula to receive donations from eligible purchases before you begin shopping. Your selection will be remembered, and every eligible purchase made at smile.amazon.com will result in a donation. You can also visit your AmazonSmile profile to see the total amount donated through your purchases. Since Bountiful Gardens closed in 2017 we are no longer able to fill orders for our publications for the general public. However, we are working to make all our publications available in electronic format, and hope to have the bulk of our booklets and papers for sale online increasingly during 2018. To view a list of all the Ecology Action publications, click here. Those listed with links are available through Amazon, or other retailers. Those without links are only available through Ecology Action for workshop participants or interns. We are working to make electronic versions of our booklet series available for download online and anticipate that most will be available by mid-summer. We apologize for the inconvenience. 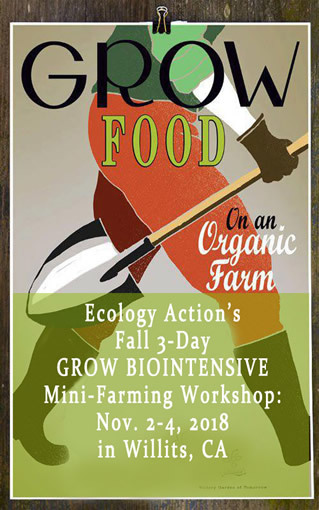 focusing on sustainable ways of living in general and GROW BIOINTENSIVE mini-farming in particular. into the future. Contact John Jeavons at Ecology Action for more information, (707) 459-0150. Rachel Laase, Kathy Cantwell and GROW BIOINTENSIVE® friends from around the world. The print version of this Newsletter is published 3 times per year. The eNewsletter follows soon after.